Archaeological evidence indicates discovery of the island by Polynesians at about 400 AD. For reasons still unknown they began carving giant statues out of volcanic rock between 1250 and 1500 CE. These monuments, known, as 'moai' are some of the most incredible ancient relics ever discovered. There are at least 288 Moai of which once stood upon massive stone platforms called Ahu. There are some 250 of these Ahu platforms spaced approximately one half mile apart and creating an almost unbroken line around the perimeter of the island. Out of the 887 statues in total, of which 288 arrived at their destination, 92 were abandoned while in transit, and 397 were never fully realized or were left behind in the Rano Raraku quarry. The tallest Moai erected, called Paro, was almost 33 feet tall and weighed 75 metric tons. The heaviest erected was a shorter but squatter Moai at Ahu Tongariki, weighing 86 tons. The most common Moai ranged from 12 to 20 feet. All but 53 of the 887 moai known to date were carved from tuff (a compressed volcanic ash). At the end of carving they would rub the statue with pumice from Rano Raraku. 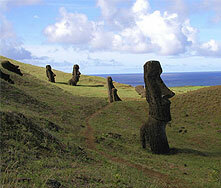 There are 13 Moai carved from basalt, 22 from trachyte and 17 from fragile red scoria. Today, most of the Moai lack eyes; however when first erected and completed, the eye sockets were inserted with a combination of white coral and red scoria, the sclera and the pupil, a bringing to life, literally, the eyes. When properly assembled, the Moai faces inward towards the island, its back to the ocean, and its eyes gazing skywards. Furthermore, many of the backsides of finished Moai have bas-relief spirals on their buttocks consisting of elaborate decoration. Ahu Akivi is an especially sacred place. Ahu Akivi is a sanctuary and celestial observatory built about 1500 AD. 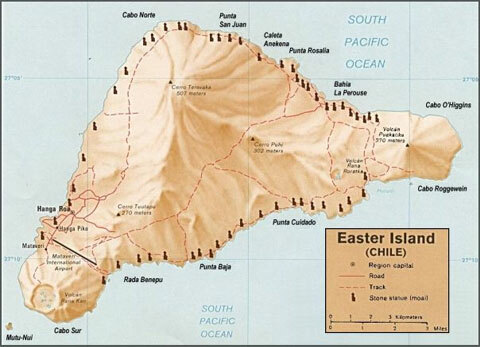 As in the case of many religious structures on Easter Island, it has been situated with astronomical precision. Its seven statues look towards the point where the sun sets during the equinox. The site is unique in that it is located far inland with statues being erected to face the ocean. This is the only site where this was done.